Unit balance has always been one of our top priorities, but is becoming increasingly urgent as we head toward beta. The reasons for this urgency are twofold: first and foremost, so that Prismata’s gameplay itself is as polished as possible before we start to heavily market the product. However, there is an additional constraint that affects us more heavily than other games: our single-player content depends crucially on the precise stats of each individual unit in the game, so we pretty much need these stats to be finalized before we can even begin to create finalized single-player content! When rebalancing Prismata units, we often make changes to their costs, HP, or other stats like lifespan, build time, and stamina. 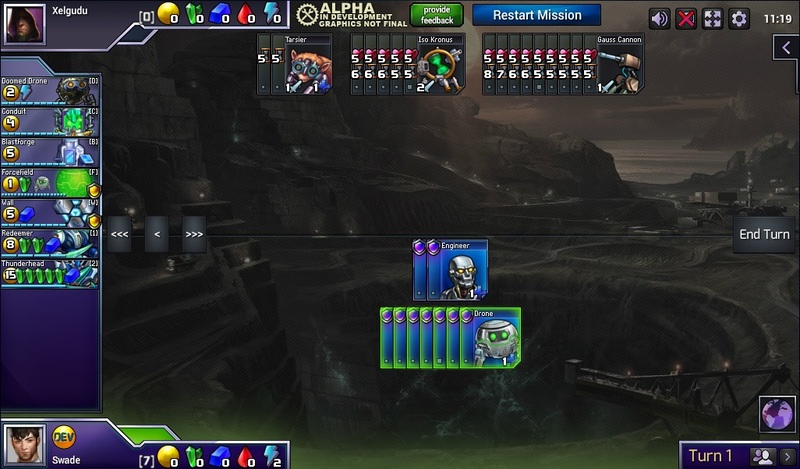 Most of our missions make use of the same Prismata units that are used in Ranked Play mode, so if a unit is modified, the modification might result in a change in difficulty of a single-player mission involving that unit. For example, nerfing the HP of an enemy unit usually makes a mission easier, and nerfing the cost of a buyable unit almost always makes a mission more difficult. This design challenge is not unique to Prismata—adjustments to unit balance also affect the difficulty of single-player content in real-time strategy games like StarCraft and card game like Hearthstone. However, the situation is much more dire in Prismata. Many of our puzzle missions are handcrafted to have unique solutions, and balance changes have the potential to completely spoil them. Many of our harder puzzles require that players make the most of every single available resource, so nerfing a buyable unit in such a mission could actually make the mission impossible! The Thunderdeemer puzzle mission. It was quite difficult before; what’s it like with the new Redeemer? Is it even possible? With the newly rebalanced Redeemer, this mission is quite different. The additional Gauss Charges make an early Redeemer purchase more punishing, but the reduced cost of Redeemer facilitates some alternate possible builds. Is the mission still possible? Is it easier? Harder? I’ll give you the answer in a moment, but first, I’d like to paint a picture of what this looks like behind the scenes. We’re working on dozens of puzzle missions, and many chapters of single-player content (containing both easy and hard versions of every mission). A modification to the balance of a Prismata unit could potentially impact many different missions, and each of these potential interactions requires our attention (since we don’t want our missions to be impossible or otherwise differ from their intended difficulty). This, in turn, imposes a massive burden on us that grows as we create more missions. Of course, some modifications have no impact whatsoever on missions. Some units simply have not been used in any missions yet. In some other cases, units are used as part of the initial player forces (or enemy forces), but are not available as purchasables, so changes to their price or buildtime leave the corresponding missions unaffected. However, in most cases, rebalancing a unit forces us to re-examine every mission that it’s used in. This can be a time-consuming process, since we may be required to alter several missions to restore their desired level of difficulty. Buffing a purchasable unit in a hard mission can be especially problematic, since it’s usually not obvious whether the buff has introduced an unintended alternate solution, and fixing broken missions can sometimes be almost as difficult as creating them from scratch. Of course, we’d much prefer to spend our time working on new single player content, rather than repairing mission designs that were broken by unit balance changes. As it turns out, the Thunderdeemer is still beatable with the new [8GGB/6 Gauss Charge] Redeemer using a very similar solution to the one that worked with the old 9GGB Redeemer (I encourage you to give it a try!) However, if we end up nerfing Redeemer further to [10GGB/5 Gauss Charges], then Thunderdeemer will no longer be possible to complete. Fortunately, the mission can easily be fixed by adding an additional turn of build-time to one of the enemy units, but such fixes don’t always come easily! How Much Can Campaign Units Deviate? As I mentioned before, the challenge of simultaneously balancing single-player and multi-player content isn’t unique to Prismata, but the difficulty of resolving it is much higher than in other games, because mission difficulty is more tightly coupled with unit balance. The industry-standard technique for dealing with this problem has, for the past several years, been to simply give up on maintaining parity between single-player and multi-player modes. Modern FPS games have been doing it for over a decade; in fact, AAA shooters frequently have entirely disjoint design teams responsible for single-player and multi-player balance. It’s not uncommon to see a weapon deal a completely different amount of damage from one game mode to another. RTS games bucked the trend for a while, but even Blizzard hopped on the bandwagon with StarCraft 2—several of the units have different build times, damage stats, cooldowns, and upgrades available in the single player mode. However, Blizzard generally attempts to maintain parity in unit prices between the campaign and multiplayer modes. Changes to prices would create a lot of genuine player confusion, whereas changes to combat statistics generally create more of a difference in “game feel”, but don’t lead to player misunderstandings or strategic difficulty. In Prismata, experimentation has taught us that we unfortunately have even fewer degrees of freedom in our single-player mission design before confusion sets in. We can sometimes get away with giving the enemy a Fabricator with higher-than-usual lifespan or HP, but changing the price or attack power of a purchasable unit is usually not feasible. When it emerged that we ought to consider nerfing Shadowfang’s cost from 7RRR to 8RRR, we immediately dismissed the idea of leaving 7RRR Shadowfangs in single-player missions while having 8RRR Shadowfangs in Ranked Play, because it would be irritating for players to transition from one mode to the other and realize that Shadowfang had changed. Our general rule of thumb has been to avoid changes to any of the stats of purchasable units in any single-player missions. We also avoid any jarring changes to the permanent stats of friendly or enemy units, but we sometimes modify stats like HP or stamina of units that are initially on the battlefield at the start of a mission. For example, in some tactics puzzles, you’ll see the enemy start with a stack of Gauss Cannons with different amounts of HP. You’ll even find a 32HP Aegis in the Cluster Conundrum puzzle (though it’s mostly just there because it seemed less annoying than a big stack of defenders). We’re happy with these decisions, and we believe that they bode well for continuity between the single-player content and the multiplayer experience. However, they do create some difficulties. The industry-standard FPS solution of giving up on maintaining design parity between campaign and competitive modes of play isn’t wholly justified by balance concerns. It’s often simply a concession motivated by the huge scale of those projects, which frequently have geographically separated studios working on different aspects of the game. Coordination between the single-player and multi-player balance teams can create all kinds of extra work for little gain. For units like Savior, we simply haven’t created any single-player content involving the unit at all. The unit’s design could completely change in unpredictable ways, so there’s no use in even trying to pin down the type of scenario that we’d like to see Savior in. Deadeye Operative is an example of a unit that is the subject of a fully-planned-out campaign scenario, but we’ve only completed a rough outline of the mission so far. In particular, it would be senseless to work on the hard version of the Deadeye mission, since we’re not yet confident that the unit won’t see further changes to its Ranked Play balance. However, we have firmly settled on Deadeye being a blue unit (this is important for some plot-related reasons). For a unit like Lucina Spinos, we held out for a long time before creating any single-player content involving the unit, since we weren’t sure if the latest version of the unit would stick around. However, we’re now confident enough in Lucina’s design being final (or close to it) that we’re willing to create missions like the newly-added Lucina’s Rage. Of course, we could still adjust the mission if Lucina was buffed or nerfed, but there is only one such mission, so we’re not too worried either way. For some units like Iso Kronus, Immolite, and Doomed Wall, we’re very happy with their current designs and confident that the current versions are final. Accordingly, we consider their designs “locked”. This means that unless we see a serious problem with these units in competitive play, we won’t be making any further changes to any of their stats. As far as missions are concerned, we hold nothing back with these units. Nevertheless, we’re still treading very carefully when it comes to the hard versions of campaign missions. Some of these missions are only winnable by a razor-thin margin—close enough to the edge of complete impossibility that we operate under the assumption that any balance change to units in the mission will require a reworking of it. Thus, we only create hard versions when the only units involved are those whose designs are very unlikely to change. Though we’re always willing to make necessary changes for the sake of improving competitive Prismata, it suffices to say that the Prismata base set, and a sizable portion of other Prismata units are essentially considered finalized over here at Lunarch HQ. We’re extremely confident in the designs of about 80% of the existing Prismata units, and we’re happily treating their current designs as if they’re set in stone for the purposes of single player mission construction. The remaining 20%? They’re mostly one-supply units like Savior, plus a few hold-outs like Deadeye and Redeemer that we’re still experimenting with. These units are generally used quite sparingly in missions. However, as we complete more of the rest of the campaign, the missions containing these hold-out units tend to occupy a higher and higher percentage of the still-to-be-completed missions. We’re getting closer and closer to the point where we need to start locking these unit designs so we can finish off the campaign. That said, we feel like we’re at the point where we could lock down a number of the hold-out units if needed, and we soon will. Consider a unit like Lucina Spinos. Could it still get changes for Ranked Play? Maybe, but it’s unlikely that these changes are going to have a huge impact on the overall enjoyability of games involving the unit. If desired, we could still easily tweak Lucina’s strength by buffing or nerfing its cost, but at some point, we face diminishing returns in our efforts to improve the unit, especially if changes to the unit’s balance require us to revisit already-completed single-player content. This holds true for a lot of other high-cost one-supply units like Centurion, Xaetron, and so on. At some point, things will have to be good enough, because we need to ship a campaign! Nevertheless, there is still plenty of time to experiment with further changes to most of the recently-tweaked units and big/expensive units, especially if we see a strong community consensus around specific units that are still problematic. If you don’t like the new Redeemer, or any other Prismata unit design, now would be a good time to let us know (via the balance feedback button in Prismata, emails, rage threads on reddit, or any other method). On the other hand, if you want the old 3-lifespan Doomed Drone back… that ship has sailed. Our last big balance patch in February was executed with the goal of helping us move quickly toward finalized designs for most of the lower-tech units that were still problematic in multiplayer. In particular, we were eagar to settle the final statline of Shadowfang, since the unit is introduced extremely early on in the campaign and used in a number of missions. We’re quite happy with the new 8RRR version of the unit (and that cost is pretty much locked in at this point), but had we gone with a 7RRR Shadowfang, we would have needed to be extremely careful that the unit wasn’t broken—nerfing the unit later would be costly if it necessitated fixing every mission where Shadowfang is purchasable. For this reason, future patches will probably err on the conservative side when it comes to attempting to find final values of unit costs and stats. You can catch a whiff of this in recent changes made to Blood Phage and Gaussite Symbiote. There may be one or two more units that receive a similar treatment soon. Of course, we also have a number of yet-to-be-released units. They too will be shown off in single-player content, but most of their appearances are slated for late-chapter missions or puzzle packs that will be released quite late, so we’re under no hurry to get them finalized. As the final adjustments to unit balance are patched in and validated through alpha testing, we’ll be moving to churn out polished single-player content, including hard versions of each campaign mission. You can see some examples in earlier prototypes, like the Vel’kar mission that’s currently available in the Prismata alpha. Originally, we had a hard version of this mission available as well, but changes to Vivid Drone and Shadowfang affected its design, ruling out several viable solutions. Expect to see some serious revisions in the final version of the Vel’kar mission when it appears in the campaign. Of course, we fully expected that we’d be making changes to the Vel’kar mission before releasing it. After all, it was just a prototype at its time of creation. The normal (non-hard) version will also likely see some edits as we adjust for difficulty and pacing. Of course, the campaign version also contains cut-scenes and other narrative bits. All in all, we’re pretty happy with our progress in finalizing unit balance for Ranked Play, and we definitely believe that Prismata is in a better state as a competitive game than it has ever been. However, we still have a few other gameplay adjustments that we’ll be trying during our alpha and beta periods, and as we split our current battle queues into Ranked Play and Casual Match queues, expect to see some further experimentation unrelated to unit balance. ← New Puzzles, Balance Patch, Collectibles, and More!